At long last, now you can get raw A123 cells without troubling through the ever inflating online drill pack market and not being certain your getting genuine A123 Cells (many of them no longer use the genuine article). Also, it has been reported that the factory warranty return cells are disposed of in that market. Our inventory is exclusively brand new factory fresh cells, no harvested/warranty return seconds. These cells are much easier to assemble into packs than harvested cells. Although many battery beginners offer questionable advice on these cells, we strongly urge use of a balance harness and balancer. All our packs come ready to use with the worlds most common balance connector. The XH plug readily fits the Astro Blinky. Our Favorite A123 balancer. CellPro and Thunder Power balancer owners need the "E-Flite adapter" in order to service our packs and a wide range of others. We get way too many phone calls checking to see if our cells are genuine A123. 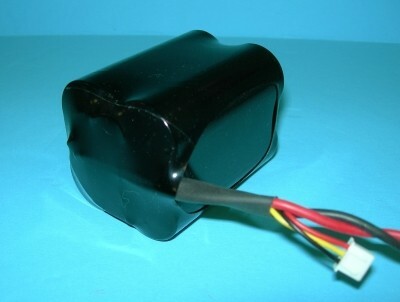 WE SELL ONLY GENUINE A123. We do not nor have we ever stocked any of the inferior brands. CellPro charger owners: You own a nice unit. We run into an amazing number of customers who purchase a CellPro charger but fail to buy the adapters which allow it to be connected to a wide variety of packs. Of what value is your investment if you fail to buy the plugs to connect it to battery packs? NOTHING comes with the FMA plug except FMA packs. You will need the XH or "E-Flite" adapter in order to interface with 70% of all packs made. Our A123 packs custom built in house come with an XH plug, you will need the adapter in order to connect your charger to our and most any other pack. Would you purchaces a boat but not buy life jackets? Would you buy a trailer for your airplanes but not a hitch? BUY THE ADAPTERS. 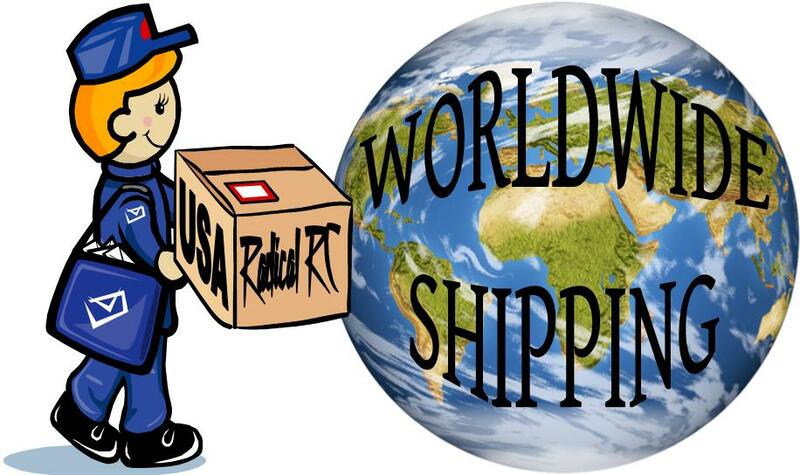 If you want packs with Cell Pro balance connectors you'll need to send those harnesses to us with your order. We do not stock this plug. 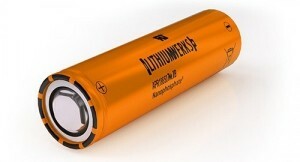 A123 Systems/LithiumWerks Nanophosphate Single Cell, 1100mAh. These batteries are capable of 30C constant discharge, with a 10 second pulse rating of 60C. Cycle up to 1000 times before significant capacity loss occurs. The rugged assembly of the products will ensure that your pack will last for years, not months. Can be repeatably charged to 100% in 15 minutes. This is the nano phosphate technology the automobile companies are testing on their future hybrid vehicles. Charge only with Lithium chargers with an A123/LithiumWerks mode limiting charge voltage to 3.6V per cell. An Astro Blinky for A123/LithiumWerks is highly recommended as a balancing aid for these cells. Dimensions 18.2mm(0.72") dia. x 64.95mm(2.56") ht. A123/LithiumWerks' High Performance Nanophospate lithium iron phosphate (LiFePO4) battery technology delivers high power and energy density combined with excellent performance and extensive life cycling in a lighter weight, more compact package. A123LithiumWerks' cells have a low capacity loss and impedance growth over time as well as high usable energy over a wide state of charge (SOC) range, allowing out them to meet requirements of many applications. These batteries are capable of 50 amp constant discharge, with a 10 second pulse rating of 120 amps. Cycle up to 1000 times before significant capacity loss occurs. The rugged assembly of the products will ensure that your pack will last for years, not months. Can be repeatably charged to 100% in 15 minutes. Charge only with Lithium chargers with an A123 (LIFE) mode limiting charge voltage to 3.6V per cell. An Astro Blinky for A123/LithiumWerks is highly recommended as a balancing aid for these cells. Dimensions 26.62mm(1.02") dia. x 66.15mm(2.6") ht. 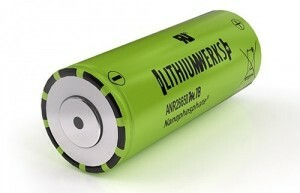 A123 Systems/LithiumWerks Nanophosphate 2S 1100mah Pack 2-#18650 Cells. These batteries are capable of 30C constant discharge, with a 10 second pulse rating of 60C. Cycle up to 1000 times before significant capacity loss occurs. The rugged assembly of the products will ensure that your pack will last for years, not months. Can be repeatably charged to 100% in 15 minutes. This is the nano phosphate technology the automobile companies are testing on their future hybrid vehicles. Standard shape is Flat (side by side) as shown in photo. Stick packs may also be constructed as a "Stick" for narrow use. See my blog post Checking A123 RX Packs For Recharge Point for help in this area. Specification's: Weight of built 2S 1100 RX pack is 3.1oz/(88g). See A123/LithiumWerks 1100 Single Cells Above for all other available data. Want a custom pack? Give us a call, 937-256-7727 and we can special make any kind of pack you require! Note: Photo shows sample Rx pack with double lead option. A123/LithiumWerks Nano phosphate 2S 2500mah Pack 2-#26650 Cells. Finest RX pack technology and cell ever produced. See individual cell listing above for cell specifications. Standard shape is Flat (side by side) as shown in photo. Stick packs may also be constructed as a "Stick" for narrow use. There is no optional length for XH balance ends - use XH extension. Use only Lithium chargers with an A123/LithiumWerks mode limiting charge voltage to 3.6V per cell. An Astro Blinky for A123/LithiumWerks is highly recommended as a balancing aid for these cells. Specification's: Weight of built 2S 2300 RX pack is 5.86oz/(166g). See A123/LithiumWerks 2500 Single Cells Above for all other available data. For checking pack voltage between flights, our best advice currently is: Leave model on after flight, plug loaded volt meter directly into pack balance plug (charge port ok but not preferred) hold load engaged, switch model off. Allow pack to drain into meter for 5 seconds, take your reading. See my blog post Checking A123 RX Packs For Recharge Point for help in this area. A123/LithiumWerks Nano phosphate 2S 5000mah Pack (configured from 2S2P 2500mah #ANR26650M1B Cells. Finest RX pack technology and cell ever produced. See individual cell listing above for cell specifications. Standard shape is Flat (4 cells side by side), square is shown in photo. Stick packs may also be constructed, however they are not repairable if a cell is damaged. There is no optional length for XH balance ends - use XH extensions for this purpose. Specification's: Weight of built 4S 2500 RX pack is 11.72oz/(332g). See A123/LithiumWerks 2500 Single Cells Above for all other available data. Note, see single cell listing above for specifications for these cells. We are happy to build your A123/LithiumWerks Electric Flight Pack for you. Packs are built by our professional in house from factory fresh cells. No worries about older manufacturing dates or earlier cell versions here. All packs include the XH Balance plug which is the worlds most popular. Fits Astro Blinky directly. Packs utilizing more than 6 cells will have multiple balance plugs. Helpful Hint: For reasons of economizing your packs over more models if the cell count is large, it is often better to use two shorter cell counts in a series Y in the larger model so the 1/2's of the pack may be used in other smaller models easily. For example, Rather than order one 7 cell pack, order a 3 and 4 cell, plug into series Y harness then into your ESC. Now you have a 3 and a 4S pack for other smaller models. We use only genuine A123/LithiumWerks cells, we do not stock any of the low performance off brands. Select your cell count, shape, wire, wire length and output connector below. Balance Plug Note: XH balance plug is single up to 6 cells, multiple over 6 cells. Shape Note: Flat and Block Offset is most popular. Block is 2 flat packs, one over the other, Block Offset is one pack laying in the valleys of the other which is about 1/3 cell diameter thinner and wider. Stick packs (end to end soldered cells) are the most difficult to service if a cell must be replaced later. Double Stick packs are often called "Shotgun" packs. Triple Stick is like 3 Barrels in a triangle, Quad Stick is like 4 barrels 2 over 2. Photo shows example 3 cell Triple Stick pack with XH Balance plug and Deans Ultra output plug on 480 wire. Note, see single cell (A123/LithiumWerks Part#26650M1B) listing above for specifications for these cells. We are happy to build your A123/LithiumWerks Electric Flight Pack for you. Packs are built by our professional in house from factory fresh cells. No worries about older manufacturing dates or earlier cell versions here. All packs include the XH Balance plug which is the worlds most popular. Fits Astro Blinky directly. Packs utilizing more than 6 cells will have multiple balance plugs. We use only genuine A123 Systems/LithiumWerks cells, we do not stock any of the low performance off brands. Balance Plug Note: XH balance plug is single up to 6 cells, multiple over 6 cells; JR & Futaba plugs can only be used to balance 2S battery packs! Note, plan your order well in advance of your need. 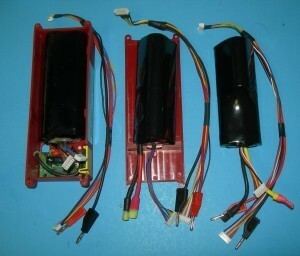 Custom multiple cell battery packs require many cells and hours to build. These packs cannot be built in a rush. Thank you for your realistic understanding and advance planning. Photo shows sample of Flat pack. If you're buying a 2S pack, select your balance plug from the 2S Balance Plug Options, then go to the next drop down and select "I chose 2S, see my choice above". If you're buying 3S or bigger, go to the 2S Balance Plug Options and select "No selection here, because I chose 3S & Up", then select the default XH Balance (most popular)..." from the 3S Balance Plugs Options (you cannot balance a 3S or bigger battery with FJ or JR plugs). Note, see single cell listing above for specifications for individual A123/LithiumWerks cells. We are happy to build your A123/LithiumWerks Electric Flight Pack for you. Packs are built by our professional in house from factory fresh cells. No worries about older manufacturing dates or earlier cell versions here. All packs include the XH Balance plug which is the worlds most popular. Fits Astro Blinky directly. Packs utilizing more than 6 cells will have multiple balance plugs. Helpful Hint: For reasons of economizing your packs over more models if the cell count is large, it's often better to use two shorter cell counts in a series Y in the larger model so the 1/2's of the pack may be used in other smaller models easily. For example, Rather than order one 7 cell pack, order a 3 and 4 cell, plug into series Y harness then into your ESC. Now you have a 3 and a 4S pack for other smaller models. These are configured as "2P" packs which make them 5000mAh packs. Select your "S" Series cell count, shape, wire, wire length and output connector below. Photo shows example of a flat pack. Custom designed A123/LithiumWerks battery to fit your Sullivan S642 battery box. 4 A123/LithiumWerks cells nominal voltage: 12.8V. More punch than a 12V lead acid or 10 cell NiCad battery. 5 A123/LithiumWerks cells nominal voltage: 16.0V. Equivalent to 13 cell NiCad/NiMH. 6 A123/LithiumWerks cells nominal voltage: 19.2V. Equivalent to 16 cell NiCad/NiMH. 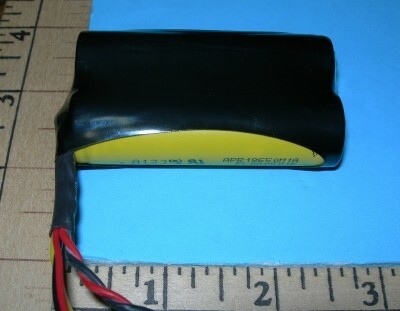 8 A123/LithiumWerks cells nominal voltage: 25.6V. Better power than two 12V Lead Acid batteries in series. We suggest our custom charge cord for directly charging the battery through the XH balance connector. Simply pop open the yellow door on the side of the holder and connect to the balance harness. The opposite end of our cord connects to both the balance input of your charger as well as the standard 4mm banana charge output port. Limit charge current to 2 amps through the balance harness. Only charge with a charger in A123/LithiumWerks balance charge mode set to proper cell count and 2 amps maximum. Special Notes for 25.6V battery: Use the 4S charge cord. The battery will have two 4S balance connector outputs. Charge through each of the two ports individually with charger set for 4S (12.8V) LIFE battery. NEVER charge them at the same time by using a Y harness or any two charge ports utilizing the same power source. If you do, fire or injury will result. (The SMOKE and BLUE LIGHT light will escape likely burning the hands that are holding the connectors, possibly ruin your battery and destroy your once beautiful battery box. Aw shucks!) Charging each 1/2 of the 8 cell pack separately and consecutively is required because most people do not own a charger capable of addressing an 8S battery pack. If you own a charger capable of 8S in LIFE mode, we can special build the pack and charge cord for you. *Lithium batteries connected to electronic circuits must be charged periodically to prevent the circuit from running the pack dry. A Lithium pack ran down to zero cannot be recovered. 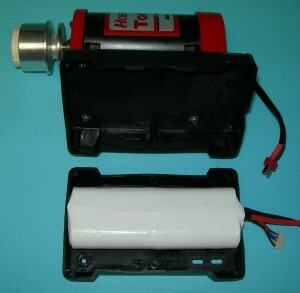 The Sullivan battery box is presumed to be designed not to ruin a battery. However, we will not provide a warranty for any battery run to zero by this or any other device. Don't ask, don't tell us about it. Test and charge your battery periodically at your own discretion. Yes, there is a small premium over our normal A123/LithiumWerks pack builds. Because of the restricted space, packs to fit the Sullivan battery box require extra time to build. *Special Note: The very early version of this battery box could run a battery down if the voltage programming button had never been depressed. This was corrected in late 2015. It's a good idea to go ahead and set the voltage even if you won't be referencing the voltage. Sullivan is a great company and this is the finest battery box available in my view. The Hobbico Power Core is a nice battery holder, the only problem is it comes with a small weakish lead acid battery inside. The voltage depression of this small battery is very large resulting in a weak performance from your starter. Running a 4S A123LithiumWerks will just about double the torque you have now. The nominal voltage of a 4S LIFE pack is 13.2v. And, It's voltage won't depress nearly as much when your squeeze the trigger delivering more torque than ever before. Our pack is designed to fit right into your Power Core case without any modifications. Although you could use the provided charge port in the power core, it is recommended that you use a Deans Ultra plug in the wire from the starter to the A123/LithiumWerks Power Core battery. This way you can unplug it and charge the pack directly. Your new battery may now be charged up to 10 amps if you please. The stock lead acid charger should be discarded. Only charge with a charger in A123/LithiumWerks charge mode. Note, you must install a connector on your starter wire up to the task. Suggested connectors are listed below. If you order a "Set for Starter Wire", you'll get a complete set of plugs. The one you don't put on the starter wire can go on the battery if you wish to install it yourself. If so, select "None" for Output Connector. If you select an output connector, we'll put it on the pack for you ready to go. You'll still need to install a plug on your starter wire to match.